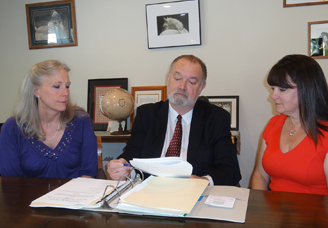 Attorney Jon Henricksen with Tammy Townsend and Margaret BaulsirJon S. Henricksen, P.C. Jon S. Henricksen, P.C. is a community-based general practice based in the heart of Clackamas County. We pride ourselves on being professional and accessible. No parking garages, no downtown traffic to fight through. We have been providing legal services to clients in Clackamas, Multnomah, Marion, Washington counties and throughout the state of Oregon since 1973, when Jon first began his practice in Gladstone. Jon, Tammy, and Margaret look forward to helping you with your legal issues. As a past municipal court judge for 28 years, Jon has presided over hundreds of DUII and criminal cases, and as a trial lawyer will effectively and aggressively represent you in court. He also understands land use and planning issues, having served as a pro tem Land Use Hearings Officer for Clackamas County. Her title is Paralegal/Office Manager, but in reality, Tammy is the glue that holds the office together. If something needs to get done — Tammy does it! Tammy has been a legal assistant since 1985 and has been here at Jon S. Henricksen, PC since 2009. Tammy is also a licensed principal real estate broker in Oregon and a licensed real estate broker in Washington. In her spare time, she loves spending time with her family (especially her new grandson!) and running. Margaret comes from a great experience of compassionate work with the elderly. Formerly as an assistant working for a prominent personal injury attorney in California, Margaret is a wonderful addition to the firm.